Several ECE faculty members are taking part in an outreach program with a local junior high in hopes of raising awareness about educational opportunities and expanding participation of underrepresented students in STEM disciplines (science, technology, engineering and mathematics). 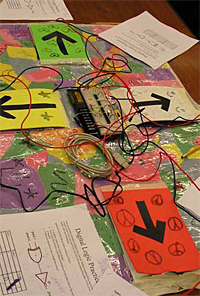 Students at Tecumseh Junior High put engineering skills to use by building their own “Dance Dance Revolution” game. Faculty members Cheng-Kok Koh, Yung-Hsiang Lu, C.S. George Lee, Dan Jiao, Cordelia Brown, Milind Kulkarni, Mithuna Thottethodi and Xiaojun Lin have joined with more than 20 ECE students to engage students at Tecumseh Junior High School in Lafayette. “We have worked with about 60 eighth-graders from the classes of Melissa George and Scott Duttlinger from the Tecumseh Junior High School,” says Koh. The program is composed of two major activities. One involves Purdue students and faculty visiting the school; the second has Tecumseh students visiting the Purdue campus and laboratories. The project was developed by Michael Gasser, a recent ECE graduate, who worked under Koh and Lu’s supervision. It began in 2009 with summer camps that collaborated with the Women in Engineering Program and the Minority Engineering Program. This summer, Tecumseh students developed a “Guitar Hero” video game.